A LATE 18TH CENTURY SATINWOOD BONHEUR DU JOUR. GEORGE III, CIRCA 1780. 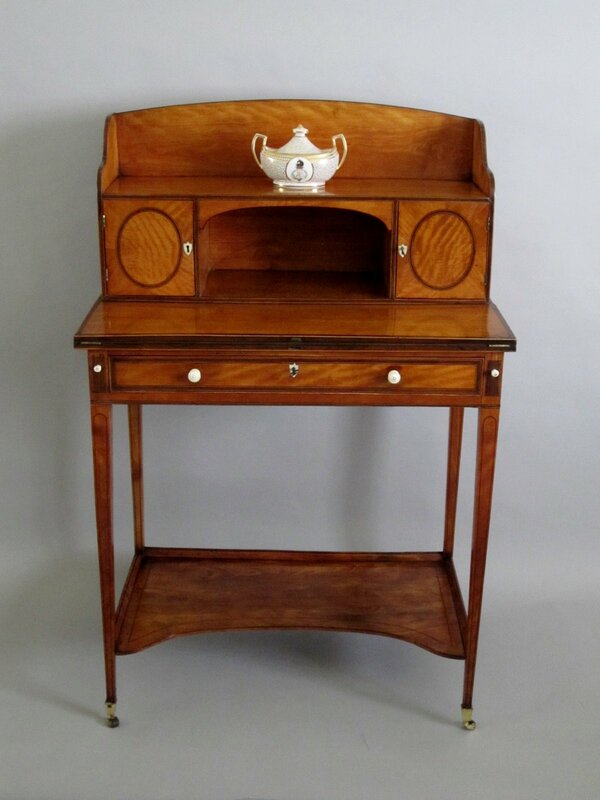 A most attractive and quite delicate cabinet piece, veneered throughout with satinwood and cross banded in rosewood with ebony & box line stringing. The single shelf upper section with shaped sides over two cupboards, one fitted with an arrangement of drawers, and flanking an arched recess. The lower section with a hinged table top, opening to reveal a leathered writing surface, over a single shallow drawer to the frieze and raised on four square and tapering legs with brass toe caps and leather castors, united by a lower concave shelf. Fully veneered on the back with satinwood. Retaining original handles.